LITTLE VILLAGE — When Evelyn Flores took over Alborada Brides in the Little Village neighborhood with her husband in 2006, she figured all of her customers would be local. But soon enough, mothers and daughters from states like Wisconsin, Indiana and Iowa started flocking to the petite boutique at 3544 W. 26th St. in search of the perfect quinceanera gown and accessories. "In small towns, they don't have as many selections; they don't have as much on hand," Flores said. "We found out that our business was 50-50: A good 50 percent [of our clients] are from neighboring states, and 50 are locals." Jaime di Paolo, executive director of the Little Village Chamber of Commerce, said there are just shy of 40 bridal shops in Little Village, many of which are starting to cater exclusively to quinceanera customers. "It used to be everything — prom, bridal, quinceanera," said Flores, whose mother has worked as a seamstress on 26th Street for years. "But then as time passed, it just started to be more quinceaneras." Flores said brides have options outside Little Village: larger shops, discount stores, national chains. 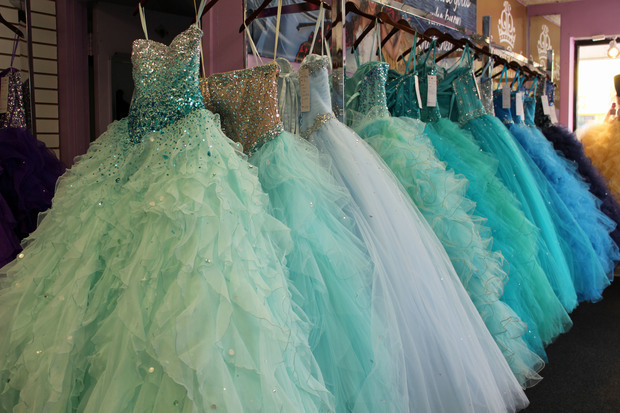 But if you're looking for the perfect quinceanera dress — that puffy, bedazzled gown that signifies for many Latin American families a teenage girl's transition from childhood to young womanhood at age 15 — Little Village is the place to be. 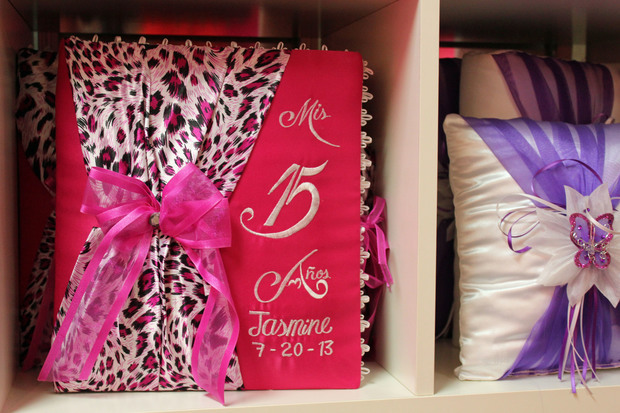 Quinceanera shops "are a big anchor to this community," di Paolo said. "People come here just for that. On weekends, the vast majority of the people around, people from the outside, came here for the bridal stores, for the quinceanera stores. "And while they're shopping, they go eat breakfast, lunch, dinner," he continued. "They go shopping for that unique item that reminds people of home [Mexico] — the Coca-Cola in the bottle. Or going to see the local butcher to get meat exactly like you want it, not prepackaged." Princess Paradise, 3235 W. 26th St.
Ana Marin, a sales associate for Princess Paradise at 3235 W. 26th St., said most of her customers come from out of state. Just recently, she had a 15-year-old girl and her mother fly in from Nebraska. "On Thursday, she had her first fitting," Marin said, "and she knows we can offer one-day alteration services. So she does her fitting, has her alterations done and can go back to Nebraska" with her dress by Monday. Those who can't stay as long opt to have their dresses shipped. Marin said the boutique, which focuses on designer gowns from Mori Lee and Mary's Bridal, sells dress and accessory packages that run upwards of $1,500. People start shopping a year in advance and can pay in installments. Abigail Cardenas, a 15-year-old from Hoffman Estates, has been dreaming of her own quinceanera since she first attended one at the age of 10. "I remember the dress and how beautiful she looked," Cardenas said during a recent fitting at Alborada Bridal. The teen distinctly remembers visiting Little Village with her family as a child and staring into the windows at the colorful dresses that lined many 26th Street storefronts. When her father gave Cardenas the option of money or a quinceanera, it was a no-brainer. "You only turn 15 once," Abigail said. In February, she and her mother, Maria Ortega-Cardenas, 40, made the first of many 80-minute drives to 26th Street, going from shop to shop in search of the perfect dress. On their second trip, Abigail settled on a mint green gown from Alborada. As the family puts the finishing touches on the July 16 party, her mother estimated the total cost of the quinceanera will be upwards of $15,000 to $20,000. Despite the cost, Ortega-Cardenas said the symbolism and what the quinceanera represents is worth it. "The huge, puffy dresses goes back to the Spanish conquest, where daughters were being introduced to communities as women in extravagant and fluffy dresses," said Gema Alamillo, who has been a saleswoman at Delaney's Bridal since 2011. "That has been carried over and remains a steadfast tradition for Mexican families, as well as some Puerto Rican and Ecuadorian families," Alamillo said. Alamillo has seen customers travel to Little Village from as far as Canada. 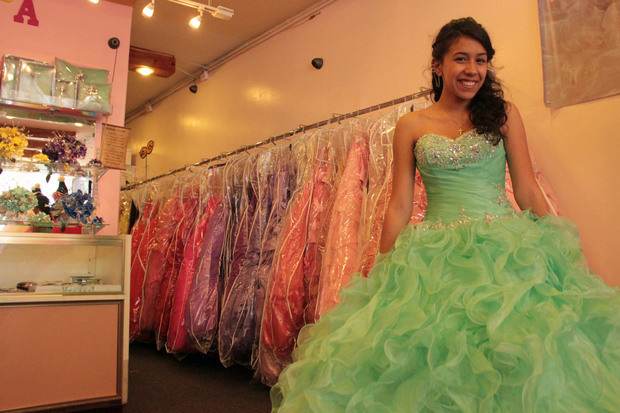 At Delaney's, a narrow shop at 3744 W. 26th St., quinceanera dresses range from $500 to $850. Two blocks down, inside Alborada, you'll find gowns that cost anywhere from $550 to $2,200. And those prices don't include accessories, such as tiaras, shoes, signature books and pillows. These easily can run an extra $1,000. "People pay as much attention to quinceaneras as weddings," Flores said. Last year, she and her husband launched Alborada magazine, an English-language project that's published three times a year. "A lot of people would come in our store and ask us: Do you know a DJ? Do you know a makeup person?" Flores said. "So we came up with this as a guide." While Flores declined to share sales figures, she said Alborada's sales have increased every single year since she bought the shop in 2006. And she doesn't anticipate those numbers dropping anytime soon. "The Hispanic community is very young," di Paolo said. "A lot of girls are turning 15 — more than are getting married." Alamillo, who's been working as a saleswoman at quinceanera shops on 26th Street since 2007, said stores see a slowdown in purchases as the weather gets colder, typically from October to January. But things pick back up in spring. "During the summer months, we make anywhere from 20 to 30 dress sales each day during weekends," Alamillo said. "It's a huge tradition, and I don't see it going anywhere."